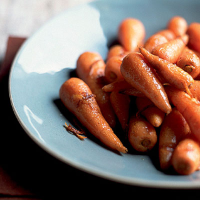 These sweet baby carrots are perfectly enhanced by sage and zesty lemon. Delicious! Put the chopped sage leaves into a pestle and add the lemon zest, then season. Pound the mixture with a mortar then stir in the lemon juice. Put the carrots into a pan of boiling water for 4-5 minutes, until they’re just tender but still firm. Drain the carrots and return to the hot pan. Add the butter and the lemon and sage mix and place everything into a warm dish to serve. This recipe was first published in September 2008.